Sweet and sometimes a little savory, the best combination of flavors right? Toss everything in a salad bowl and top with the honey and balsamic! Delicious and light! I love this as a fancy dinner dish and it has such a classic pesto presentation! Saute the kale with the oil, garlic, ricotta and oil for three minutes in a pan. Pulse the kale, ricotta, olive oil, garlic, and add some teaspoons of water if it gets too thick. Add the sauce to the wheat pasta and serve after heating everything through in a pan! Add pepper to taste and top off with Parmesan! I am obsessed with salmon. It is probably the reason I can never go completely vegetarian. I love the beautiful peachy color of the fish and I love what it does for my mood, my skin, my body, and my tastebuds. If you are not a huge salmon person (WHY?) , you can adapt this to a different fish like haddock, tilapia, or tuna, but this sweet and savory combination on salmon is my favorite weeknight dinner. And it is fast! I have these ingredients on hand all the time and since they make such a good pair, I use it on chicken and other proteins too! The brown rice black quinoa blend is the perfect side and with another side of steamed spinach or sautéed kale, you are set to go! Mix honey, balsamic, salt and pepper will and brush on steamed salmon filet. 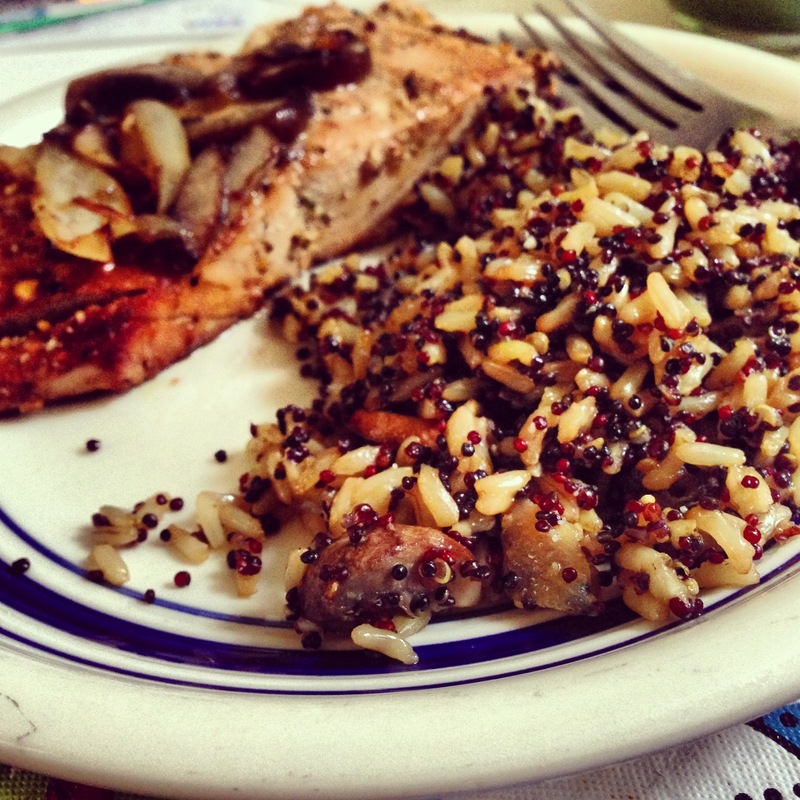 Combine cooked rice and quinoa and assemble on top! Who isn’t a fan of chef salad? I love the tastes of a good house dressing, and my college had this great bar restaurant where everyone went out to and ate at. It’s one of the things I miss a lot about college, but I don’t miss how I used to look like. I need to put up a progress picture soon. Eating healthy isn’t something that came on when I decided I wanted to lose weight. I just wanted to feel better since I was lethargic all the time, and my mood was pretty sour. Now, the idea of creating new healthy recipes is a fun game for me. This blog has helped me a lot in challenging myself and trying new things. Mix oil and vinegar with pepper in a bowl. Layer salad with the dressing on the bottom and the ingredients in the middle, with the spinach on top so it stays fresh. 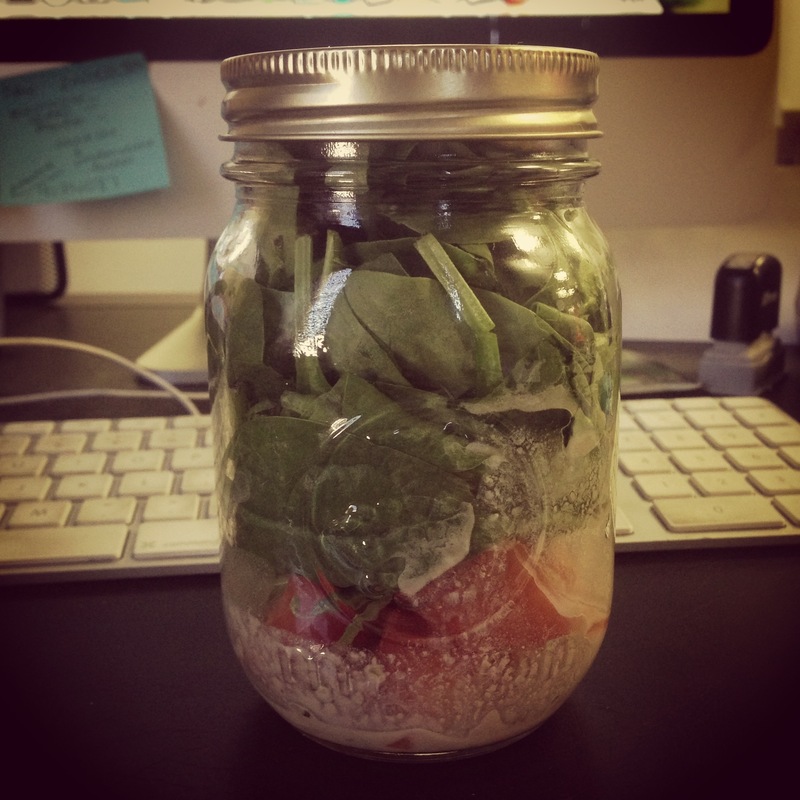 I liked it in this order but you can alter it to your tastes: dressing, tomatoes, egg, avocado, cheese, spinach. This is an all time favorite. 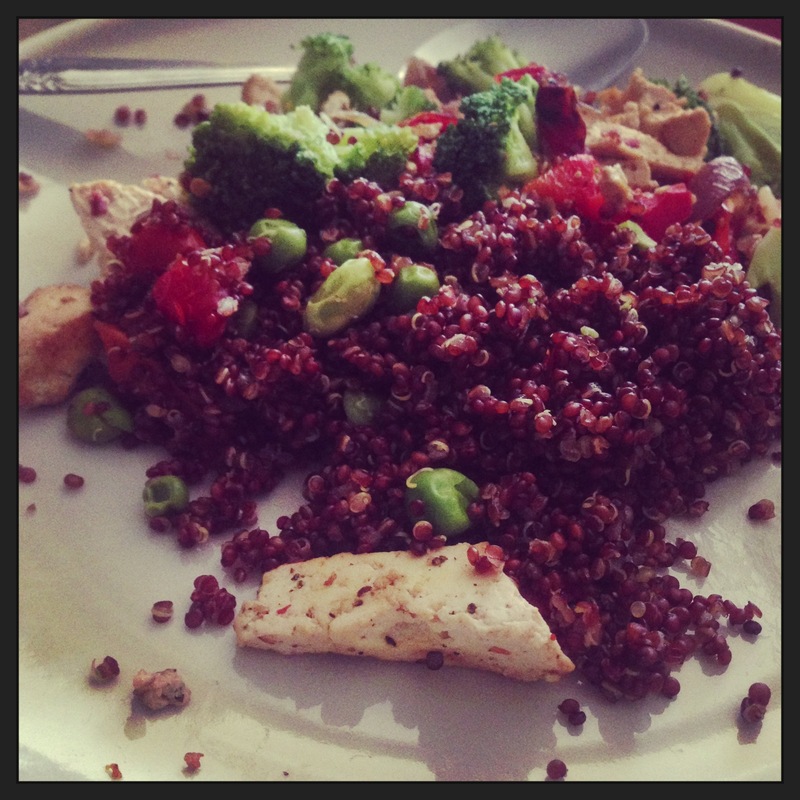 I have been on this red quinoa obsession lately and this is the best combination yet. 1/2 cup cooked red quinoa, you can find this awesome blend from Trader Joe’s and other health stores! Heat all ingredients together and serve! 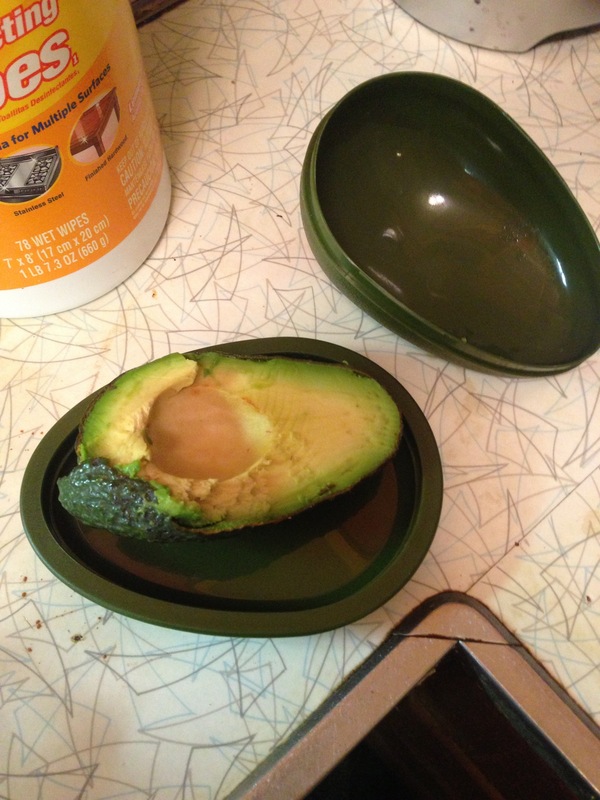 Also great as a leftover! I am in this sweet potato and cinnamon obsession phase lately, but I don’t hate it! I have been experimenting with some new recipes and this is one of my favorite ones, so give it a try and tell me what you think! Mash everything together and serve hot! Add more soy milk if it is too thick. There are tons of recipes for kale chips out there, and most of them are pretty much the same. My standard go to kale chip is the olive oil sea salt and peppered kind but I do want to experiment. Here is a starter recipe. Preheat oven to 300 degrees. Wash and dry kale. Cut up kale bunches and remove the heavy stems. Cut up the kale into bite sized pieces. Sprinkle with salt and pepper and place on a baking sheet sprayed with nonstick spray or butter spread with flaxseed oil. 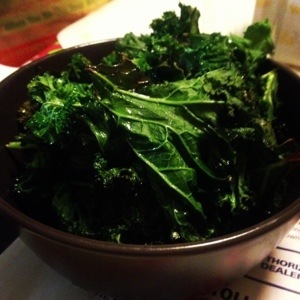 Toast kale chips for about six to seven minutes. Keep an eye on these as they can burn quite easily! planning on serving this for Christmas dinner today! Preheat oven to 350 degrees. Boil the vegetable broth and add macaroni. Stir occasionally until cooked, which is usually about eight minutes. 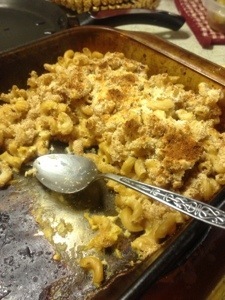 The dish will cook more in the oven so take out macaroni at a little bit before al dente. 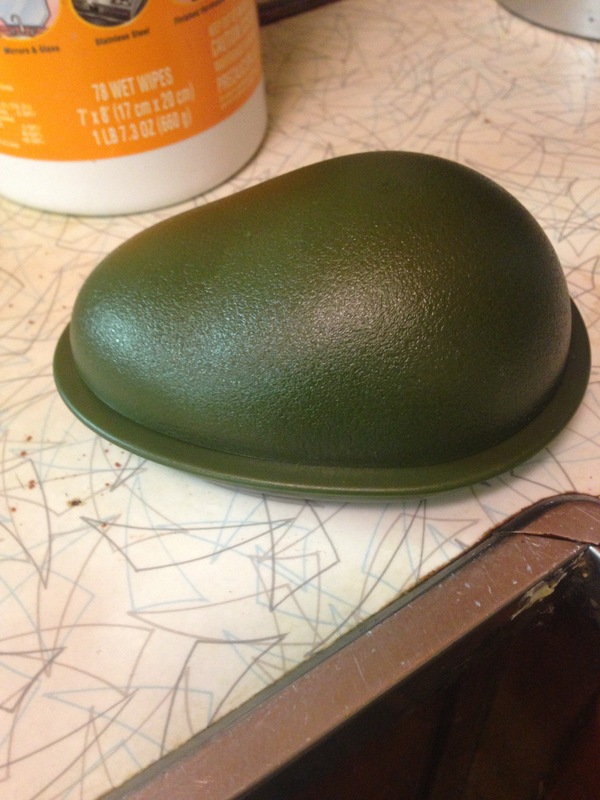 Spray a baking dish with a nonstick spray or flaxseed butter spread. Drain pasta and add steamed vegetables. Add garlic poser stirring well. In a separate pot, add Greek nonfat Yogurt and sharp cheddar cheese until melted. Add pepper and chili flakes. Pour over macaroni, adding more if desired. Pour mixture into a baking dish and top with Parmesan and spicy breadcrumbs for a nice, crunchy crust. Put into oven and bake for seven minutes or until the crust is cooked through.